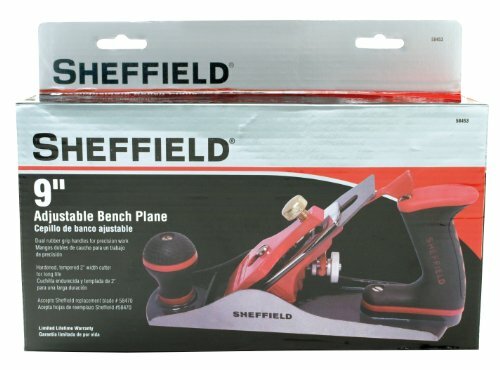 The 9-Inch Adjustable Bench Plane from Sheffield Hardware with a 2-Inch cutter has a cast iron base and is manufactured to work with all bench-top projects. The plane features hardened, tempered-steel construction for accuracy and the dual wood handles allow for precision work that will last for years. The ergonomic rubber grip provides comfort during long use, reducing fatigue. This plane accepts Sheffield Hardware replacement blade 58470. If you have any questions about this product by Sheffield, contact us by completing and submitting the form below. If you are looking for a specif part number, please include it with your message.